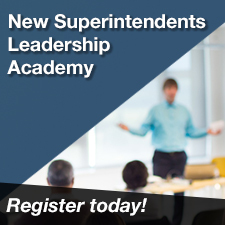 New Superintendents Leadership Academy: Now Hiring! Hiring and retaining the best employees for all students and learning community is one of the most important responsibilities of a school leader. Learn why it is critical to have clearly defined, district-wide processes for creating the master schedule, staffing, and recruiting that focuses on standard practices, shared responsibilities, and a laser-like focus on hiring the best people for the district. Identify essential stages needed for a comprehensive hiring process from identifying vacancies, to on-boarding, and everything in between. Participants will discuss how to meet the needs of millennial candidates, the challenges with negotiating the hard-to-fill positions, and the key to retaining employees. This is an interactive workshop allowing participants to analyze and make improvements to their own current hiring practices. When: Feb. 19, 2019, from 9 a.m. to 4 p.m.